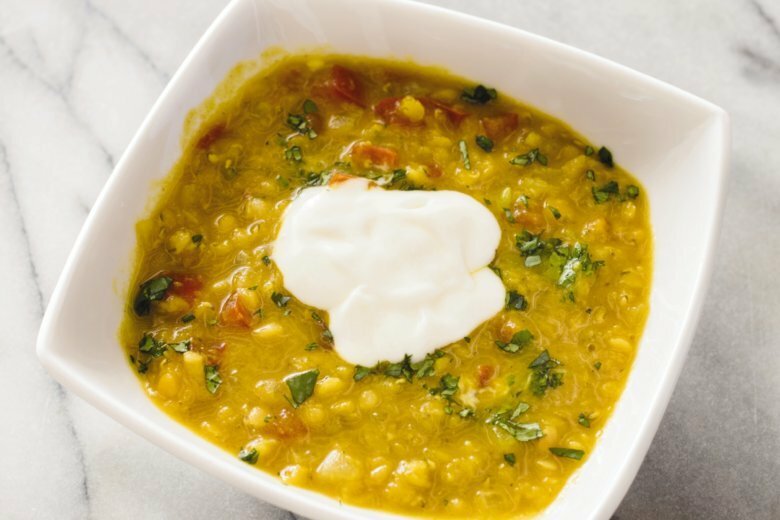 Small red lentils are perfect for a hearty, satisfying soup. Small red lentils are one of our favorite legumes; they do not hold their shape when cooked but break down into a creamy, thick puree_perfect for a hearty, satisfying soup. Lentils are popular in quick-cooking soups because of their short cooking time and the fact that they don’t require soaking before cooking. To speed things up even further, we precooked the lentils in the microwave while we assembled the soup base. The mild flavor of the lentils did require some embellishment, which we achieved thanks to curry powder and fresh ginger. Sauteing the curry powder with garlic and the ginger before adding the lentils and the broth was key, as it intensified and deepened their flavors. Chopped fresh tomato enlivened the soup and added some complexity. Do not substitute brown lentils for the red lentils here; brown lentils have a very different texture. Microwave lentils and 2 cups broth in bowl until lentils are nearly tender and most liquid is absorbed, about 8 minutes. Meanwhile, melt butter in Dutch oven over medium heat. Add onion and cook until softened, about 5 minutes. Stir in garlic, ginger, and curry powder and cook until fragrant, about 30 seconds. Stir in microwaved lentil mixture, tomato, and remaining 2 cups broth and simmer until lentils are very tender and flavors meld, about 15 minutes. Season with salt and pepper to taste. Sprinkle individual portions with cilantro and dollop with yogurt before serving. Nutrition information per serving: 289 calories; 68 calories from fat; 8 g fat (4 g saturated; 0 g trans fats); 17 mg cholesterol; 305 mg sodium; 39 g carbohydrate; 10 g fiber; 7 g sugar; 18 g protein.